Since my last AccuRaw post was so clear – AccuRaw close-to but not as good as the X-Pro1 JPEG, I thought it would be useful to muddy the waters a little. I selected the last two sample images because they had lots of fine, green detail. Which ACR struggles with. But this is not representative of many photographs. So I have a new sample with fine detail, but no leaves. The scene is quite flat, yes. This is the JPEG from the camera. Provia color. It matches how I remember the scene quite well. 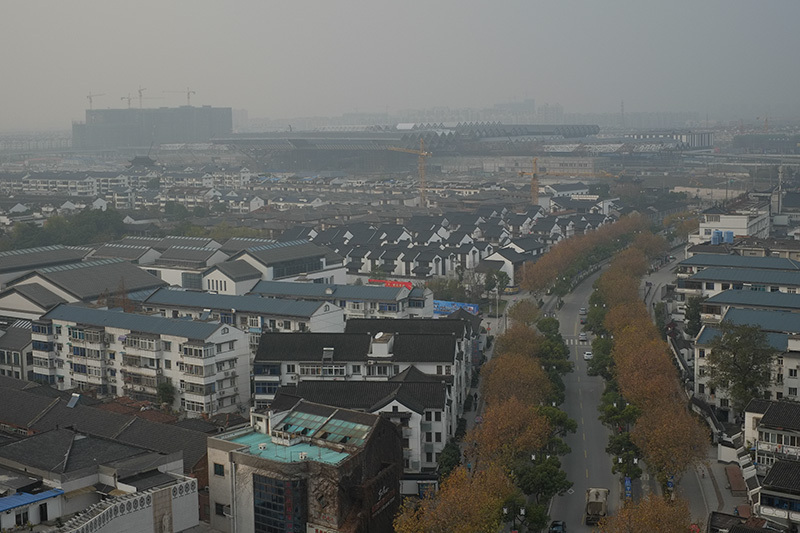 The crops are taken from the center. Now the AccuRaw and JPEG are very close. 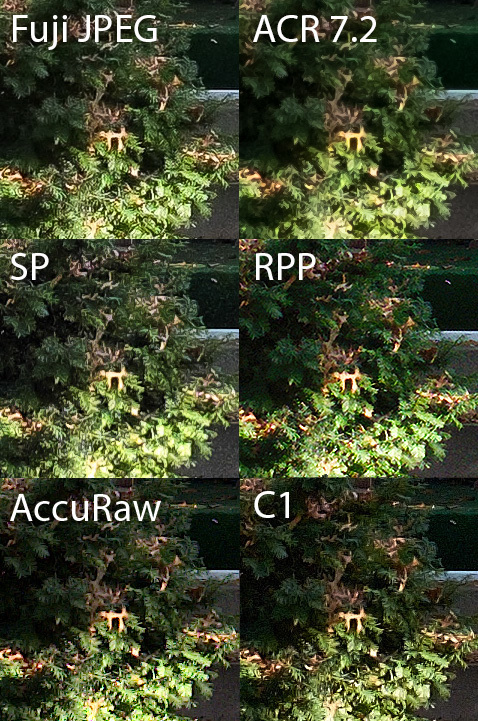 The AccuRaw files are a touch crisper, but have a little more sharpening applied. You can see clearly how the CA Suppression in the AccuRaw software helps to control the moire that appears. Still, a little moire is still visible in the CA suppressed conversion. The RPP file is the worst in this set. Mushy. Lots of artifacts. The ACR example is very very clean. No hints of noise. Not much fine detail. If you push the sharpening you can see the “watercolor” effect occurring. The SP file is also not too impressive. The clarity of the tree branches is a lot worse than the JPEG or the AccuRaw conversion. The moire is a lot less visible (though still present). It is interesting that despite Fuji’s claims, moire is still present in the file. It apparently requires some demoisaicing hijinks to remove. 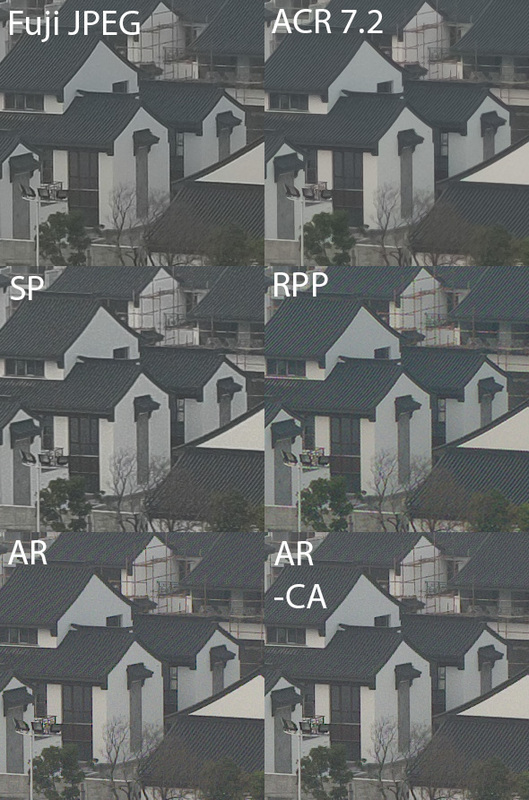 If I stare hard enough at the JPEG file it looks like perhaps the roofs with the worse moire in the RPP/AR files have a touch less detail…. There’s been a lot of buzz about the new CaptureOne 7.02 beta with X-Trans support. When the NDA lifts, I hope to publish an analysis of how it performs. But today I can talk a brand new RAW converter. It’s from Sandy, of Cornerfix and Chromasoft fame. Name? AccuRaw. It’s a no frills RAW converter. Spiritually, I see it as a Mac version of his iOS RAW converter, PhotoRaw. Sandy was kind enough to share 0.9.5 with me and give me permission to discuss the output. The interface is simple and straightforward. In short, you open to a browser view, pick a RAW file, then edit in a new window. It takes roughly five seconds to initially interpret an X-Pro1 RAW file (about two seconds faster than Adobe Camera RAW). Each setting change takes a few seconds to complete on my quad-core i7 powered MacBook Pro running 10.8. The timings could change (for the worse or better) by the time the software is released. 1. It explicitly aims to produce accurate rendering of color and tone. 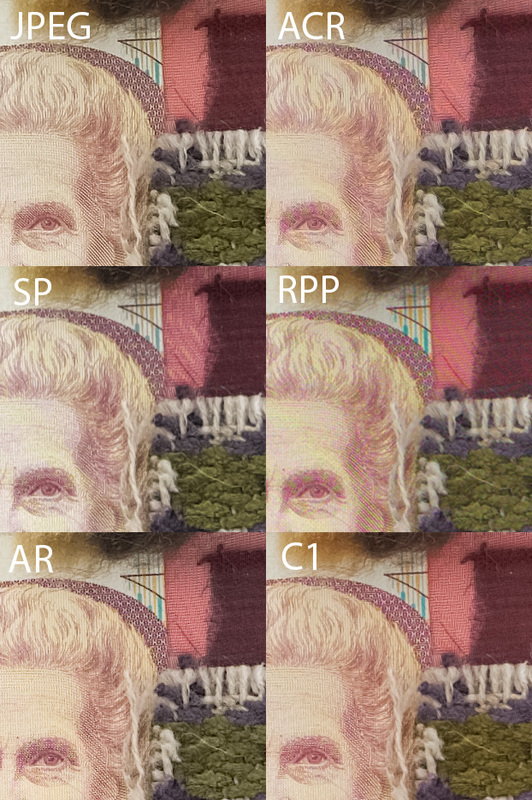 Many RAW converters, by default, will produce a fairly contrasty and saturated image. 2. It gives you control over multiple sources of artifacts. By default, it shows you maximum resolution. It then allows you to independently reduce chroma (color) and luma (brightness) artifacts – the downside being resolution is reduced. You can also sharpen the chroma and luma channels independently. Sandy has told me the X-Trans demosaicing is largely complete, so I believe what I show you will be consistent with the final release. On to the comparisons! Let’s see our two test images from my last X-Trans RAW conversion post (settings for the first four outputs can be found by checking the just-mentioned link). Both AccuRaw outputs have had the black point brought up to make the overall tone similar to the other four outputs. 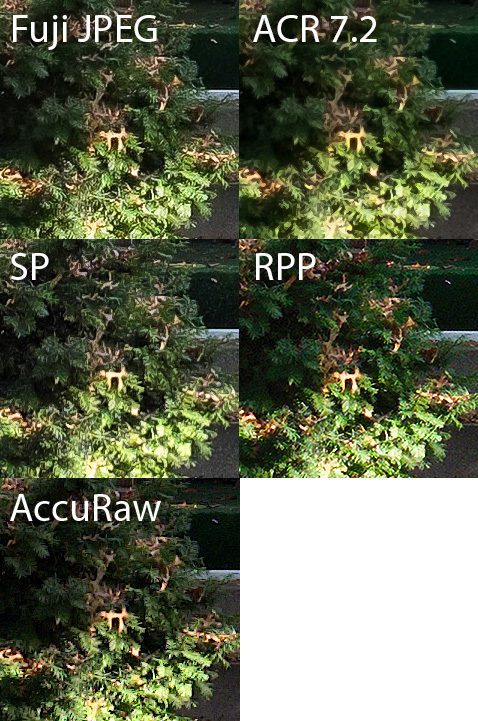 AccuRaw default uses the default settings (with the exception of 40% luma sharpening) and AccuRaw tuned is the same as before except for 60% Chroma Artifact Suppression, 20% Luma Artifact Suppresion, and 20% Post-demosaic Filter. 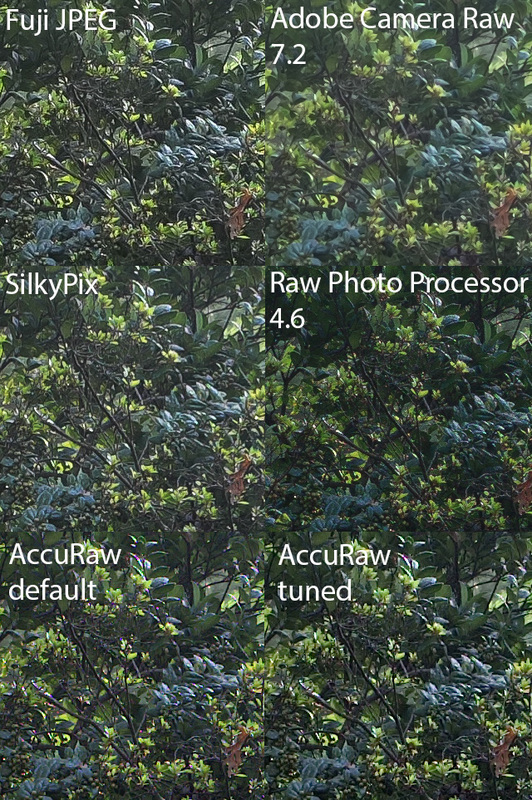 I’d say the Fuji JPEG still is the best, with Silkypix and AccuRaw following closely behind. Then comes RPP. In last in ACR. You can clearly see how the Chroma artifacts (the colored dots) are removed significantly in the tuned AccuRaw version with only a touch less micro-contrast and resolution. Still, a few remain – the leaf to the right of the ‘w’ in the AccuRaw images is the worst offender in the entire image. The AccuRAW version avoids the “zippering” of the RPP conversion, also. Next up is the second comparison – the bush scene. This tests the RAW converters even more because this is an iso800 scene. Now noise becomes a confounding factor. Settings as before for the first four. AccuRaw has had the contrast touched up like before. Default settings, with two adjustments – 20% Chroma Artifact Suppression and 60% Chroma Sharpening. Fuji JPEG is still the best. Good detail, clean shadows, and little noise. Fuji is doing something clever with the noise reduction. However, now I think AccuRaw is a clear number 2. The noise pattern is tighter and the pine needles are less blotchy than SP. 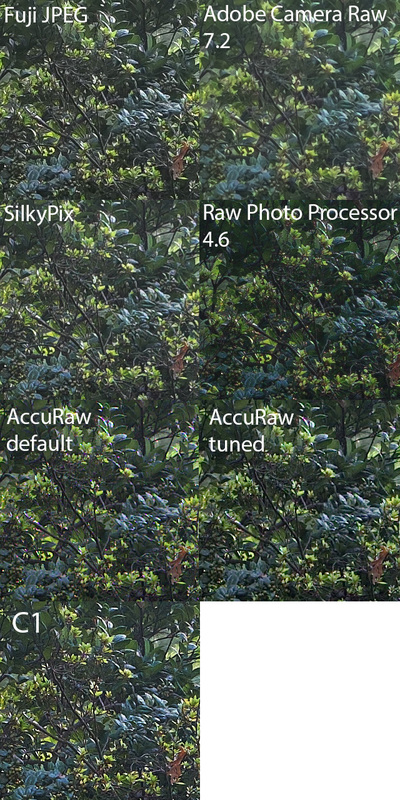 I’m happy that concrete efforts are being made to improve Fuji X-Trans RAW conversion. AccuRaw is a nice step forward. Its conversions, while a touch short of the in-camera JPEGs of the X-Pro1 (and XE-1) is good enough to be, all around, better than the current X-trans conversion front-runner, SilkyPix. It also has a much less cluttered user interface! Clearly, there’s a lot more to compare – highlight recovery, tonality, color accuracy……but I won’t be covering that. My quick impression is that the software with its default settings produces highly detailed images with accurate colors (maybe a bit muted in saturation compared to other converters) and low contrast – good for further tweaking. I think this software is best aimed at people who are interested in extracting maximum detail from a select number RAW files. If you are an picky photographer who enjoys tinkering with RAW files, then give this software a look when it comes out.